In this report, we describe work in progress on a long-range project to model combustion within a moving piston. While the ultimate goal is a three-dimensional simulation of the interaction between vortex stretching, flame propagation and large-scale eddy formation, the current project is aimed at a 2-D calculation of the effect of varying fuel inlet placement and inclination angles on flame propagation in a swirling fluid. The equations of motion are the equations of zero Mach number combustion, which describe viscous, uniformly compressible flow. At the core of the hydrodynamic calculation is the random vortex method, originally designed for high Reynolds number turbulent flow. 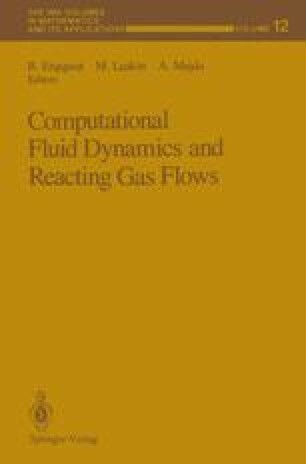 At the center of the flame algorithm has been a volume of fluid advection scheme to track the motion of the burning fluid. While this will probably remain the main ingredient on the combustion side, we are currently studying a new algorithm that is proving particularly useful for the analysis of specialized combustion phenomena requiring highly accurate schemes.